If you arrive in Halifax on Monday, please join us for a drink and hors d’oeuvres at The Lord Nelson Hotel beginning at 6 p.m. Drop in when you can and stay as long as you wish. No registration is required, but this is a chance to pick up a programme and a special surprise! 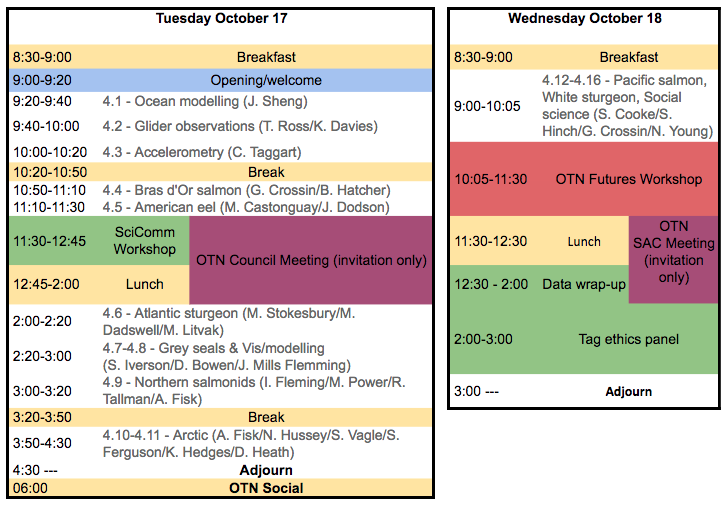 Tuesday (October 17) will consist of a full day of presentations. Wednesday (October 18) will consist of presentations and workshops. These events will take place in the Great Hall, the same venue as past symposia. PPT presentation format is required. PIs and HQP will more or less present together as they decide is best. It’s up to your lab/group to decide who is saying what under the below format guide and please cover the duration of the project. Within your given time allotment*, please leave time for questions/discussion: we recommend ~3-5 mins for 20-min slots and ~7-10+ mins for 40-60-min slots. OTN will direct-book attendees’ flights. If you do not book your travel at least 2 weeks prior to your planned arrival in Halifax you will not be reimbursed. Travel arrangements will be reimbursed following the Symposium. Meals will be provided during the Symposium (Tuesday and Wednesday — breakfast, lunch, breaks, and during workshops). Additional meals (e.g. supper) for non-Halifax residents during their travel or stay will be reimbursed based on Dalhousie University per diem rates. As this year’s symposium falls on academic dates, Dalhousie residences are not available; accommodations for both HQP and PIs will be at The Lord Nelson Hotel under the OTN room block. The cost will be paid directly by OTN. HQP: Please indicate one roommate of your selection with whom you will share accommodation.